Madhya Pradesh (MP) (, , meaning Central Province) is a state in central India. Its capital is Bhopal and the large cities are Indore & Jabalpur. Nicknamed the "heart of India" due to its geographical location in India, Madhya Pradesh is the second-largest state in the country by area. With over 75 million inhabitants, it is the fifth-largest state in India by population. It borders the states of Uttar Pradesh to the northeast, Chhattisgarh to the southeast, Maharashtra to the south, Gujarat to the west, and Rajasthan to the northwest. Its total area is 308,252 km2. Before 2000, when Chhattisgarh was a part of Madhya Pradesh, Madhya Pradesh was the largest state in India and the distance between the two furthest points inside the state, Singoli and Konta, was 1500 km. The area covered by the present-day Madhya Pradesh includes the area of the ancient Avanti mahajanapada, whose capital Ujjain (also known as Avantika) arose as a major city during the second wave of Indian urbanisation in the sixth century BCE. Subsequently, the region was ruled by the major dynasties of India. By the early 18th century, the region was divided into several small kingdoms which were captured by the British and incorporated into Central Provinces and Berar and the Central India Agency. 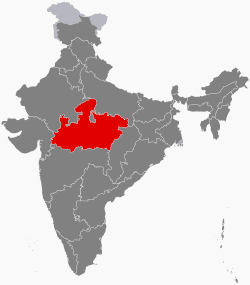 After India's independence, Madhya Pradesh state was created with Nagpur as its capital: this state included the southern parts of the present-day Madhya Pradesh and northeastern portion of today's Maharashtra. In 1956, this state was reorganised and its parts were combined with the states of Madhya Bharat, Vindhya Pradesh and Bhopal to form the new Madhya Pradesh state, the Marathi-speaking Vidarbha region was removed and merged with the then Bombay State. This state was the largest in India by area until 2000, when its southeastern Chhattisgarh region was made a separate state. In recent years, the state's GDP growth has been above the national average. Ujjain emerged as the predominant commercial centre of western India from the first century BCE, located on the trade routes between the Ganges plain and India's Arabian Sea ports. The Satavahana dynasty of the northern Deccan and the Saka dynasty of the Western Satraps fought for the control of Madhya Pradesh during the 1st to 3rd centuries CE. Subsequently, the region came under the control of the Gupta empire in the 4th and 5th centuries, and their southern neighbours, the Vakataka's. The rock-cut temples at Bagh Caves in the Kukshi tehsil of the Dhar district attest to the presence of the Gupta dynasty in the region, supported by the testimony of a Badwani inscription dated to the year of 487 CE. The attacks of the Hephthalites or White Huns brought about the collapse of the Gupta empire, which broke up into smaller states. The king Yasodharman of Malwa defeated the Huns in 528, ending their expansion. Later, Harsha (c. 590—647) ruled the northern parts of the state. Malwa was ruled by the south Indian Rashtrakuta Dynasty from the late 8th century to the 10th century. When the south Indian Emperor Govinda III of the Rashtrakuta dynasty annexed Malwa, he set up the family of one of his subordinates there, who took the name of Paramara. The Malwa Sultanate was conquered by the Sultanate of Gujarat in 1531. In the 1540s, most parts of the state fell to Sher Shah Suri, and subsequently to the Hindu king Hemu. Hemu, who had earlier served as the General of the Suri dynasty, operated from the Gwalior Fort during 1553–56 and became the ruler of Delhi as a Vikramaditya king winning 22 battles continuously from Bengal to Gujrat and defeating Akbar's forces in the Battle of Delhi on 7 October, 1556. However, he chose Delhi as his capital after his formal Coronation and left Gwalior. After Hemu's defeat by Akbar at the Second Battle of Panipat in 1556, most of Madhya Pradesh came under the Mughal rule. Gondwana and Mahakoshal remained under the control of Gond kings, who acknowledged Mughal supremacy but enjoyed virtual autonomy. The Mughal control weakened considerably after the death of Emperor Aurangzeb in 1707. Between 1720 and 1760, the Marathas took control of most of Madhya Pradesh, resulting in the establishment of semi-autonomous states under the nominal control of the Peshwa of Pune: the Holkars of Indore ruled much of Malwa, Puars ruled Dewas and Dhar, the Bhonsles of Nagpur dominated Mahakoshal-Gondwana area, while the Scindias of Gwalior controlled the northern parts of the state. The most notable Maratha rulers of the region were Mahadji Shinde, Ahilyabai Holkar and Yashwantrao Holkar. Besides these, there were several other small states, including Bhopal, Orchha, and Rewa. The Bhopal state, which paid tribute to both the Marathas and the Nizam of Hyderabad, was founded by Dost Mohammed Khan, a former General in the Mughal army. After the independence of India, Madhya Pradesh was created in 1950 from the former British Central Provinces and Berar and the princely states of Makrai and Chhattisgarh, with Nagpur as the capital of the state. 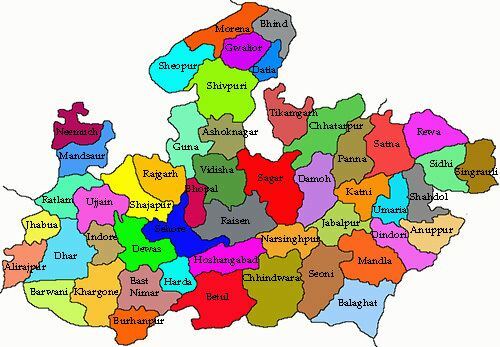 The new states of Madhya Bharat, Vindhya Pradesh, and Bhopal were formed out of the Central India Agency. In 1956, the states of Madhya Bharat, Vindhya Pradesh, and Bhopal were merged into Madhya Pradesh, and the Marathi-speaking southern region Vidarbha, which included Nagpur, was ceded to Bombay state. Jabalpur was chosen to be the capital of the state but at the last moment, due to some political pressure, Bhopal was made the state capital. In November 2000, as part of the Madhya Pradesh Reorganization Act, the southeastern portion of the state split off to form the new state of Chhattisgarh. Madhya Pradesh literally means "Central Province", and is located in the geographic heart of India, between latitude 21.2°N-26.87°N and longitude 74°02'-82°49' E. The state straddles the Narmada River, which runs east and west between the Vindhya and Satpura ranges; these ranges and the Narmada are the traditional boundary between the north and south of India. The highest point in Madhya Pradesh is Dhupgarh, with an elevation of 1,350 m (4,429 ft). 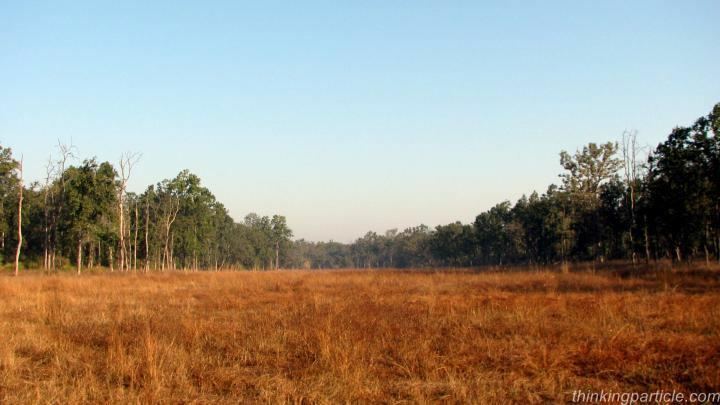 According to the 2011 figures, the recorded forest area of the state is 94,689 km2 (36,560 sq mi) constituting 30.72% of the geographical area of the state. It constitutes 12.30% of the forest area of India. Legally this area has been classified into "Reserved Forest" (65.3%), "Protected Forest" (32.84%) and "Unclassified Forest" (0.18%). Per capita forest area is 2,400 m2 (0.59 acres) as against the national average of 700 m2 (0.17 acres). The forest cover is less dense in the northern and western parts of the state, which contain the major urban centres. Variability in climatic and edaphic conditions brings about significant difference in the forest types of the state. The population of Madhya Pradesh consists of a number of ethnic groups and tribes, castes and communities, including the indigenous tribals and relatively more recent migrants from other states. The scheduled castes and the scheduled tribes constitute a significant portion of the population of the State. The main tribal groups in Madhya Pradesh are Gond, Bhil, Baiga, Korku, Bhadia (or Bhariya), Halba, Kaul, Mariya, Malto and Sahariya. Dhar, Jhabua and Mandla districts have more than 50 percent tribal population. In Khargone, Chhindwara, Seoni, Sidhi, Singrauli and Shahdol districts 30–50 percent population is of tribes. According to the 2011 census, the population of the tribals in Madhya Pradesh was 15.3 Million, constituting 21.1% of the total population. There were 46 recognised Scheduled Tribes and three of them have been identified as "Special Primitive Tribal Groups" in the State. Due to the different linguistic, cultural and geographical environment, and its peculiar complications, the diverse tribal world of Madhya Pradesh has been largely cut off from the mainstream of development. Madhya Pradesh ranks very low on the Human Development Index value of 0.375 (2011), which is below the national average. According to the India State Hunger Index (2008) compiled by the International Food Policy Research Institute, the malnutrition situation in Madhya Pradesh was "extremely alarming", receiving a severity rating between Ethiopia and Chad. The state ranks is also the worst performer in India, when it comes to female foeticides. The state's per-capita gross state domestic product (nominal GDP) is the fourth lowest in the country (2010–11). MP is also the lowest-ranked state on the India State Hunger Index. Madhya Pradesh is noted for its classical and folk music. Some of the noted Hindustani classical music gharanas in Madhya Pradesh include the Maihar gharana, the Gwalior gharana and Senia gharana. Two of the medieval India's most noted singers, Tansen and Baiju Bawra, were born near Gwalior in present-day Madhya Pradesh. Noted Dhrupad exponents Aminuddin Dagar (Indore), Gundecha Brothers (Ujjain) and Uday Bhawalkar (Ujjain) were also born in present-day Madhya Pradesh. The birthplaces of noted playback singers Kishore Kumar (Khandwa) and Lata Mangeshkar (Indore) and singer and composer Aadesh Shrivastava (Jabalpur) are also located in MP. The local styles of folk singing include Faga, Bhartahari, Sanja geet, Bhopa, Kalbelia, Bhat/Bhand/Charan, Vasdeva, Videsia, Kalgi Turra, Nirgunia, Alha, Pandwani Gayan and Garba Garbi Govalan. Madhya Pradesh's gross state domestic product (nominal GDP) for 2013-14 was ₹ 4,509 billion (approximately US$ 72,726,000,000). The per-capita figure was US$ 871.45 in 2013-14, the sixth-lowest in the country. Between 1999 and 2008, the annualised growth rate of the state was very low: 3.5%. Subsequently, the state's GDP growth rate has improved significantly, rising to 8% during 2010–11 and 12% during 2011–12. The state has an agrarian economy. 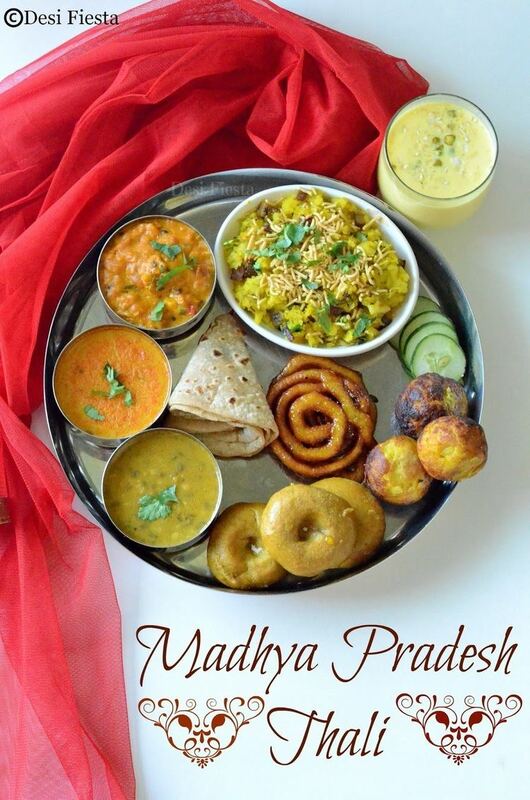 The major crops of Madhya Pradesh are wheat, soybean, gram, sugarcane, rice, maize, cotton, rapeseed, mustard and arhar. Minor Forest Produce (MFP), such as tendu leaves used to roll beedi, sal seed, teak seed, and lak also contribute to state's rural economy. Madhya Pradesh has 5 Special Economic Zones (SEZs): 3 IT/ITeS (Indore, Gwalior), 1 mineral-based (Jabalpur) and 1 agro-based (Jabalpur). In October 2011, approval was given to 14 proposed SEZs, out of which 10 were IT/ITeS-based. Indore is the major commercial centre of the state. Because of the state's central location, a number of consumer goods companies have established manufacturing bases in MP. The state's tourism industry is growing, fuelled by wildlife tourism and a number of places of historical and religious significance. Sanchi and Khajuraho are frequented by external tourists. Besides the major cities, Bhedaghat, Bhimbetka, Bhojpur, Maheshwar, Mandu, Orchha, Pachmarhi, Kanha, Jabalpur and Ujjain are the other popular tourist destinations. The state is home to some of the premier educational and research institutions of India including Indian Institute of Science Education and Research (IISER) Bhopal, IIM Indore, IIT Indore, NITTTR (Bhopal), Maulana Azad National Institute of Technology(Bhopal), IIITDM Jabalpur and IIITM Gwalior, Indian institute of Tourism and Travel Management(IITTM, Gwalior), SPA Bhopal, IIFM (Bhopal), National Law Institute University (Bhopal), Institute Of Engineering & Science IPS Academy Indore, All India Institute of Medical Sciences Bhopal and Jabalpur Engineering College. The state also has a veterinary science university (Nanaji Deshmukh Veterinary Science University) with three constituent colleges at Jabalpur, Mhow and Rewa. First state private university of MP is "Jaypee University Of Engineering & Technology, Guna" build as very beautiful campus on NH-3. JUET is ranked 86 in top 100 as per NIRF. Cricket is the most popular sport in Madhya Pradesh. There are three international cricket stadiums in the state – Nehru Stadium (Indore), Roop Singh Stadium (Gwalior) and Holkar Cricket Stadium (Indore). Madhya Pradesh cricket team's best performances in Ranji Trophy was in 1998–99, when the Chandrakant Pandit-led team ended as the runner-up. Its predecessor, the Indore-based Holkar cricket team, had won the Ranji Trophy four times.